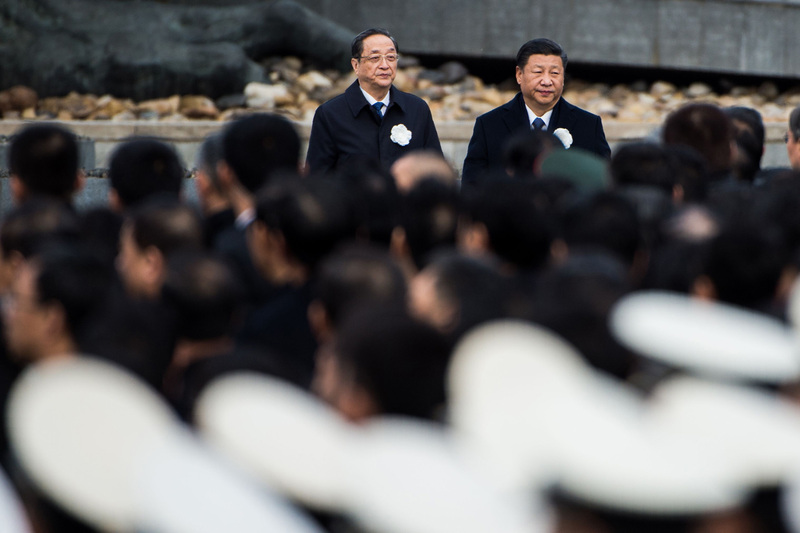 BEIJING - China marked the 80th anniversary of the Nanking Massacre on Wednesday with a call to work with Japan for peace, but President Xi Jinping kept a low profile and left the main public remarks to another senior official, apparently in consideration for Japan-China relations. It is rare for Xi not to deliver a speech when he attends a national event. China and Japan have long sparred over their painful history. China consistently reminds its people of the 1937 massacre, in which it says Japanese troops killed 300,000 people in what was then its capital. A postwar Allied tribunal put the death toll in the eastern city of Nanking at 142,000, but some conservative Japanese politicians and scholars deny a massacre took place at all. Ties between China and Japan, the world’s second-and third-largest economies, have been plagued by a long-running territorial dispute over a cluster of East China Sea islets and suspicion in China about efforts by Japanese Prime Minister Shinzo Abe to amend Japan’s pacifist Constitution. However the two countries have sought to get relations back on track, and Abe and Xi met last month on the sidelines of a regional summit in Vietnam. Speaking on Wednesday at a memorial in Nanking, Yu Zhengsheng, who heads a high-profile but largely ceremonial advisory body to China’s parliament, said China and Japan were neighbors with deep historic ties. China would deepen relations with all its neighbors, including Japan, on the basis of amity, sincerity and friendship, Yu said, in comments carried live on state television. “China and Japan must act on the basis of both their people’s basic interests, correctly grasp the broad direction of peaceful and friendly cooperation, take history as a mirror, face the future, and pass on friendship down the generations,” Yu said. Doves, to signify peace, flew overhead after Yu finished speaking. A sombre Xi, wearing a white flower in his lapel to symbolize mourning, stood in the audience but did not speak. The Chinese president aimed to “hold back harsh criticism of Japan” at the ceremony, an expert on Japanese affairs said. Japan’s government had been wary of Xi’s possible remarks at the anniversary event, after learning that he would attend the ceremony for the first time in three years. His decision not to deliver a speech “reflected the Xi leadership’s positive attitude toward improving ties with Japan,” a Japanese diplomatic source said. At a summit with Prime Minister Shinzo Abe in Vietnam last month, Xi declared a fresh start for the Japan-China relationship. The Abe administration now aims to arrange a visit to Japan by Chinese Premier Li Keqiang at an early date, a subsequent China visit by Abe, and a trip to Japan by Xi. In Tokyo, Chief Cabinet Secretary Yoshihide Suga spoke of the importance of looking to the future. “The leaders of Japan and China have agreed in past meetings to further improve relations and it is important, while cherishing this trend, to together show a future-oriented stance,” Suga told a regular news conference. 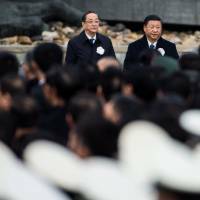 It was the second time Xi has attended the event since China marked its first national memorial day for the massacre in 2014. At that time, he called on China and Japan to set aside hatred and not allow the minority who led Japan to war to affect relations now.